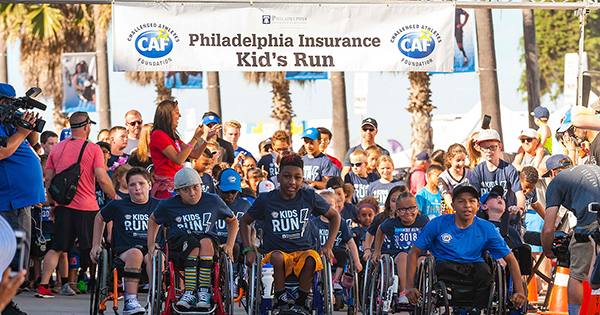 When I was hired at Philadelphia Insurance Companies (PHLY) almost 10 years ago, learning about the Challenged Athletes Foundation was an unofficial part of my new hire orientation. PHLY is committed to health and wellness, and my boss at the time, Tim Maguire, was involved in CAF as a board member and an avid triathlete. Tim was always excited to recruit new people into the sport and he told me he was certain I would love participating in CAFâ€™s triathlon. By the end of my first week on the job, I was registered!I had no experience with triathlons, but the enthusiasm and encouragement I received at work helped me as I trained for a one mile swim, 56 mile bike ride, and 13 mile run. Five months later, on a misty October morning, I found myself in a seal-like wetsuit standing at the waterâ€™s edge of La Jolla Cove, joined by too many sea lions for my liking.I was terrified and excited at the same time. Surrounded by hundreds of swimmers and hundreds more cheering supporters, the wave horn blasted and I hit the water to start one of the most amazing and unforgettable days Iâ€™ve ever experienced. It was an event unlike any other and I was hooked!Participating in the San Diego Triathlon Challenge changed my perspective in many ways and endeared me to CAF. I can recall the challenge I faced during the bike ride of my first triathlon; it was a rainy and cold day and I was struggling to warm up after the swim.My feet were numb and the road conditions were very poor for a road bike. I was trying to stay positive, but I was cold, tired, and feeling overwhelmed with five miles to go.Struggling to climb the imposing Torey Pines Hill and wanting to quit, I was passed by three challenged athletes. One had an amputated arm with a prosthetic attached to his handlebar. Another had a prosthetic leg attached to her pedal and was climbing this hill with one leg. The third was a paraplegic in a handcycle powered only with his arms.They were rain soaked, too, but smiling and cheering each other on. They had no option to quit. They were stronger than their challenges and knew they could make it if they stuck together and had faith in their training and the power of positive thinking. That moment is one I wonâ€™t forget – I was inspired and motivated and it put everything into perspective. I stayed on my bike and focused on what I had seen in the past few months since being introduced to CAF. There were women with prosthetic legs running marathons. Men in wheelchairs mastering ski slaloms. Children in wheelchairs doing wheelies and laughing with each other.Â Blind swimmers braving the open ocean. Â CAF helps make a life of sport and fitness available to so many with physical challenges. They find a way to make it happen.I recall an overwhelming sense of gratitude carried me to the finish line. Gratitude for my own health after surviving cancer a few years prior; gratitude for a body that allowed me to ride for 56 miles; and gratitude for my friends and family that supported my fundraising efforts so that these three challenged athletes could be out there on the road that day. With all those positive images running through my head, I felt a renewed energy and enough strength to get past the discomfort and finish the course.It was a reminder of a truth we all know, but often lose sight of. Our thoughts have a significant influence on our external realities. Focus on the pain, and you attract more pain. But focusing on the positive brings energy and power to overcome so many challenges.I believe choosing to focus on the positive will also bring a sense of gratitude for all the good we have in our lives. It brings more appreciation for our bodyâ€™s health and also inspires us to do good deeds for others. Doing good for others brings a beautiful sense of purpose and energy into your life.That moment on Torrey Pines Hill solidified my sense of gratitude and confirmed my belief in positive thinking. One of the most powerful things success-seekers can take away from the world of sports and athletic achievement is the effectiveness of visualization and positive thinking; a simple yet life-changing practice.Since that day, I have completed several half marathons, many Century rides, and three Ironman 70.3 triathlons. With the proper training, gear, motivation, and support, so many goals are achievable. Thatâ€™s where CAF has an incredible impact. Leveling the challenges of gear and training so everyone who wants it, can have a spot at the start line. I continue to carry the CAF torch at PHLY. I am now the team captain for PHLY each year, aiming to raise awareness about CAFâ€™s mission and money to support it. Over the years, I have organized TEAMPHLY teams that include employees, spouses, agents, and neighbors. Each year, I arrange fun activities to help raise money like auctions, restaurant parties, skate nights, power yoga marathons, and â€“ my favorite thus far â€“ a midnight glow-in-the-dark spin class.Â About 30 people join the team each year and raise more than $20,000 in addition to the money PHLY contributes as a sponsor. I volunteer about 100 hours each year to recruit participants in the community and plan local fundraisers, then volunteer during the weekend of SDTC at run clinics, registration day, and goodie bag distribution at the CAF headquarters. Itâ€™s always amazing to have introduced a new person to the events and see their huge smiles when itâ€™s over. They are so happy to have been involved in making an impact in the lives of so many people! There is something for everyone at this unforgettable sports weekend. If youâ€™re a swimmer, cyclist, or runner thereâ€™s a segment for you! 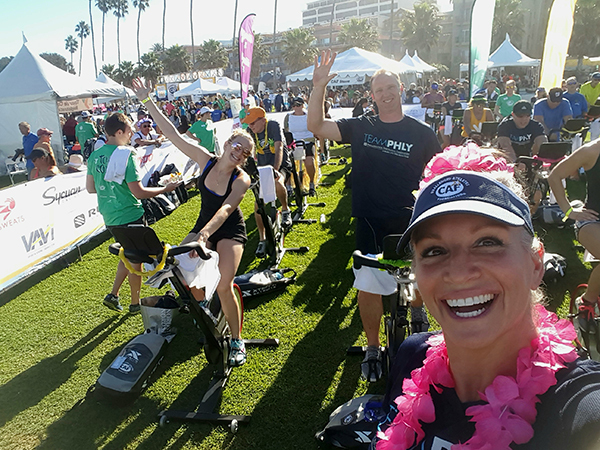 If you enjoy spinning on a stationary bike, youâ€™ll love the Spinathon on the grass overlooking the ocean. For competitive participants, there are individual triathlon slots and a Spin Marathon for 4.5 hours. New this year is a fun PowerYoga event! There are also endless volunteer opportunities available on Saturday and Sunday of event-weekend. The event is very family friendly with bounce houses, games, and fun expo booths in a gorgeous setting in La Jolla Cove. The San Diego Triathlon Challenge is an event unlike any other. If you ask anyone who has attended, they will share what an impact it had on them. I know itâ€™s had a forever-impact on me.